Every year I make a holiday card with gray and/or silver, with sparkles of course! This card is one that you can replicate over and over again and quickly make all those holiday cards you need to send! It is using only ONE stampset, ONE ink color! On Whisper White cardstock, stamp the tree from Snow Swirled in Basic Gray as well as stamp Season's Greetings at the bottom of the same piece of paper. Using the two-way glue pen, dab where you want the glitter to be. Sprinkle Dazzling Diamonds (glitter) over cardstock and shake/blow off excess glitter. Adhere to Brushed Silver cardstock. Wrap sheer ribbon around the panel. Tie in a knot. 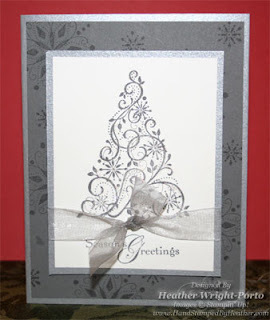 In Basic Gray, stamp the various snowflakes on the Basic Gray cardstock. Then adhere with SNAIL adhesive to silver card front. When finished, adhere the tree panel to the card front with Stampin' Dimensionals. I put one in each corner and one in the middle.